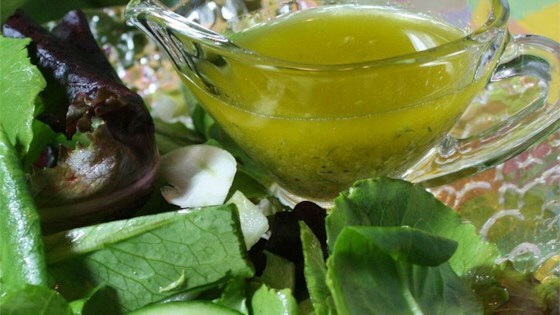 "The two most important ingredients for this or any vinaigrette are the olive oil and the vinegar. For the oil try using cold pressed, extra virgin, and made from 100% Italian olives. For the vinegar, try using a 40 year old sherry vinegar from Spain. Also try adding a dash of Dijon mustard for a kick to this dressing." Whisk together the olive oil, wine or sherry vinegar, shallot, parsley, basil, garlic, salt and pepper. Allow to refrigerate overnight. Remove from refrigerator and serve at room temperature. This was OK, it was pretty average. I don't know too many people who would use 40 year old sherry for a salad dressing. It's not exactly cheap. Kind of standard but better with the dijon; didn't care for the parsley addition.